Since the early 1990s, Dawson Cabinetworks Inc., has been installing custom kitchens in Toronto and Mississauga, and has been manufacturing and installing custom kitchen cabinets, custom reception desk, custom made bars, and custom millwork in both residential and commercial properties. Our work speaks for itself --- custom crafted from the highest quality materials and professionally installed by our friendly, knowledgeable staff, it adds style and function to virtually any space. With solid wood, laminate, wood veneer, and melamine, as well as numerous paints, stains, glazes, and finishes, all applied in-house, Dawson offers a virtually endless array of options. We can even incorporate metal and glass in a variety of traditional and contemporary designs. Best of all, every aspect of your custom kitchen cabinetry is exactly the way you want it --- size, shape, colour, design --- every detail is up to you. 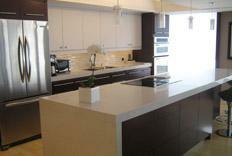 We don’t sell prefabricated kitchen cabinets or customize a generic line of products. 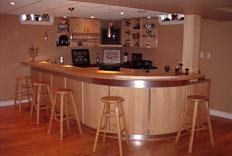 We build each and every cabinet or millwork project from scratch, exactly to specification. Our work is 100 percent custom for your 100 percent satisfaction. At Dawson Cabinetworks Inc., it's not just our cabinetry and millwork that are customized. Our experienced, dedicated staff also offers personalized service. We started as a sole proprietorship, and even though we've grown since then, we've maintained that small-business feel. Of course, that doesn't mean we work on a small scale. Our 5,000-square-foot shop is fully equipped and automated to handle projects large and small, producing top-quality products quickly and affordably.